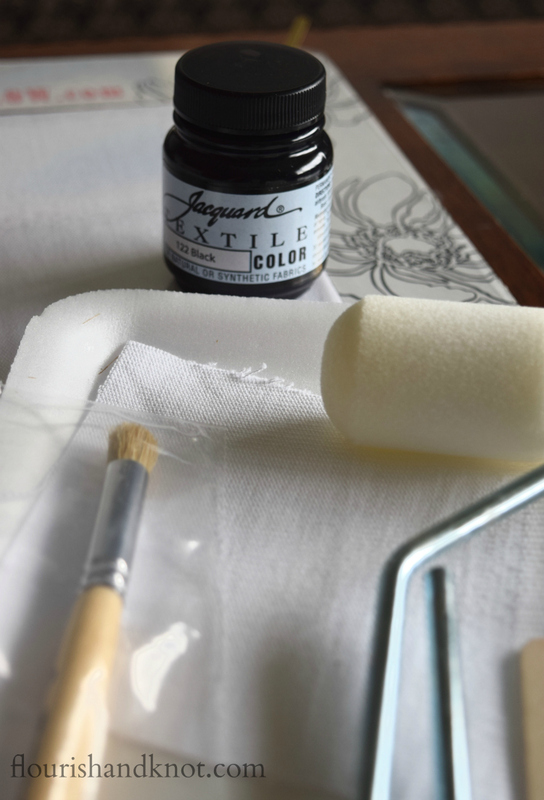 I received one Paint-a-Pillow Kit from Cutting Edge Stencils in exchange for writing this post. All opinions are my own. If you are a regular reader of Flourish & Knot, you’ll know that I love to decorate for holidays using creative, DIY touches. This month, I’ve teamed up with 14 other bloggers to bring you the October Create & Share, a craft hop where we each take a particular item and personalize it differently. For October’s Create & Share, we were challenge to create a customized Halloween pillow, generously supplied by Cutting Edge Stencils. My Paint-a-Pillow Kit arrived on Friday afternoon and I quickly got down to the business of coming up with a design. I knew that I wanted to take the basic crow stencil further, but I wasn’t sure exactly how to put my personal spin on it. And then it hit me! A literary-themed pillow, incorporating Edgar Allan Poe’s “The Raven”! Perfect for our literature-loving household. I’ll be honest and admit that I had only read “The Raven” once, back in high school, so I had a bit of brushing up to do. So eerie and spooky. Perfect for this time of year! Once I had decided on the poem, I wanted to evoke that romanticism in my design, so I chose to paint my raven in a misty, ombré style. Here’s how to create your own Poe-etic pillow. The kit comes with detailed and easy-to-follow instructions. Everything arrives ready to paint: the pillow cover and stencil are even already secured in the painting frame! This really is a no-fuss set up. The directions were very clear in how the paint should be applied: using the roller, I layered on the black paint (which came with the kit) in light, repeated strokes. To clean up the edges of the stencilled design, the kit provided a round, flat-bristled brush. Throwback to my childhood: I remember my mom stencilling things just like this! She’d dab, dab, dab away… I’m so glad stencilling is back! Once I had built up the foundation for my design, I got to work creating the ombré effect. Creating the gradient ombré style was very simple. For this step, I added in my own white acrylic paint. Using the brush, I mixed the black and white paints together in darkening shades of grey and dabbed it on, beginning at the bottom of the stencil. All in all, I really had nothing to worry about: if I didn’t like the way a particular area was looking, I could simply go back and paint over it! I carefully removed the stencil, washed my brushes and roller, and allowed the design to dry for several hours. 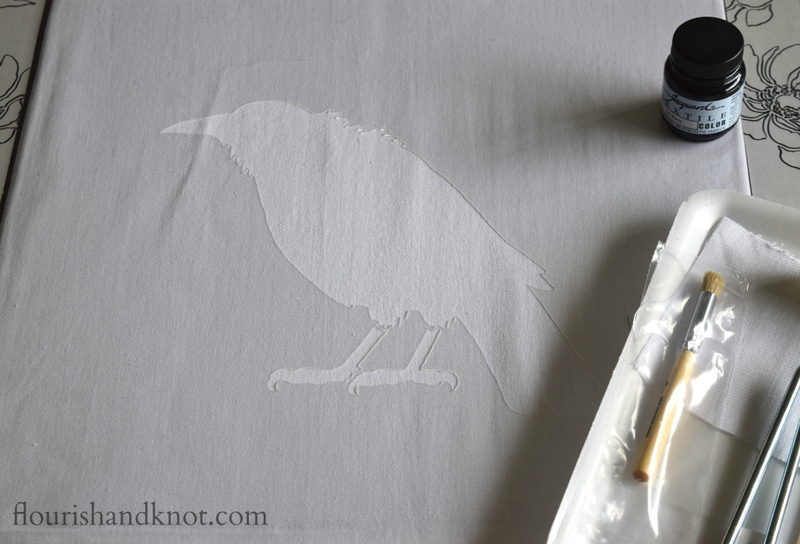 Once it was dry, I outlined the raven with the final stanza of the poem – taking a few liberties with the text, for the sake of space – using a Sharpie fabric pen. I was leery about using fabric pens on my pillow, but it turned out perfectly. It was very helpful that the kit came with a small swatch of the pillow fabric, which allowed me to test out the paint colours and my Sharpie pen. Taping the pillow to the frame made writing on the fabric much easier. I simply turned the whole kit when I needed to change the angle of my writing! To finish my pillow, I added some grey braid as a frame for the Raven. To do this, I used painters’ tape to tape off the edges (so that the braid would be straight), and glued on the braid with Hi-Tak craft glue. Once the glue had set, I removed the tape and voilà! I can honestly say that this kit would be the perfect gift for anyone who likes DIY but doesn’t necessarily do a lot of it. I see it working well as a housewarming gift or for a new university student. Who wouldn’t like to have a beautiful new throw pillow for their sofa or dorm room? It would also make a really unique wedding or bridal shower gift, and at $45, it would be a budget-friendly choice. Enter our giveaway for your chance to be 1 of 3 winners of a Cutting Edge Stencil or Paint-a-Pillow kit of your choice valued up to $50! Scroll down for even more chances to win. To enter, use the Rafflecopter link below. There are plenty of options for stencil designs (they aren’t all Halloween-themed!) to be found on Cutting Edge Stencils’ website. I want to thank CES again for providing me with my Paint-a-Pillow Kit! 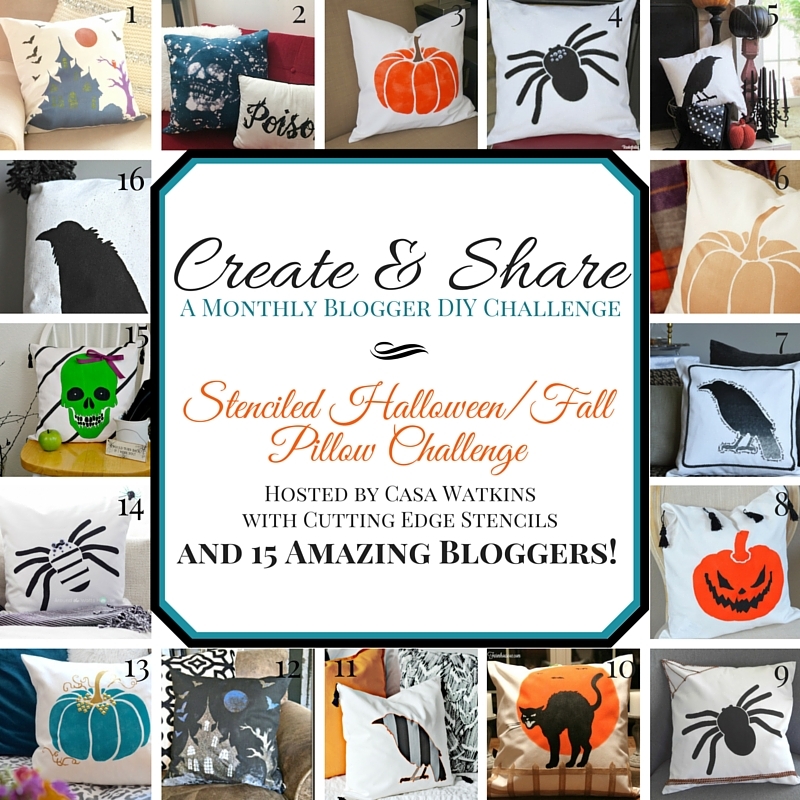 Now’s your chance to check out all the other pillow designs from the Create & Share bloggers! Please “hop” around and visit them to see their fabulous creations. This post was featured at the Halloween Spooktacular Party and Share it One More Time! How do I enter the giveaway ? Hi Jennifer! Thanks for the heads-up. The link is fixed! Just click to enter. So Cool! Love the added detail and the black fade on the crow! Great job. Girl, this is beautifully done and your handwriting looks incredible. I love this pillow! Thanks – I was nervous about my handwriting! I love it! So creative to add the text around your raven! Hi, Sarah ~ I love that you incorporated a little Poe into your pillow! And the ombre effect on your raven adds just the perfect touch of spooky! Awesome job! Great job Sarah! I love the ombre Raven and the quote around him. Your handwriting is gorgeous; there is no way I could have made it look this good! This is amazing! I love the addition of the quote, so great! Thank you! Don’t forget to enter the giveaway! Yes, it is really easy to use! Thanks for stopping by. I love that you did a poem around your design! Love it! Great job! Great pillow!! Love their stencils, especially the Resonance Wall Art Stencil! But where do we comment for the giveaway??? Hi farmquilter! You just need to click the link that says “ENTER the Rafflecopter giveaway HERE” and it will take you to the widget to enter. You’ll be able to log in and earn extra entries by following each of the hosts on Pinterest! This is so cute! I love the writing and you are so creative! The poem really does kick it up a notch. I love it. This is Awesome! So creative and the poem is a unique twist. Great project. Tweeted. Thanks, Stephanie! I loved yours too! I really like the arrow stencils, such a cute idea. I agree! Thanks for stopping by. I hope you entered the draw! I am such a ridiculous fan of Edgar Allan Poe and everything that represents him, to include the Raven. This pillow looks fantastic! Thank you for linking up with us at Welcome Home Wednesday! Thank you so much – I’m glad to find a Poe fan out there! Thanks, Meg! I was so nervous about the handwriting, but it turned out ok!